The Bone deformer operates the same as a human limb does and is composed of a pivot, as a starting point, and bones and articulations. 1. In the Deformation toolbar, disable Setup Mode . When Setup Mode is disabled, the default colour of the deformation control is light green. If you leave Setup Mode on, you will modify the resting position of the deformer chain, instead of animating it. If you had made changes to your rig in Setup mode, you can select the deform group and click on Copy Resting Position to Current button. This resets the rig outside Setup mode to match what the rig looks like in Setup mode. 4. In the Top level of the Network view, press [Ctrl] + [A] (Windows/Linux) or [⌘] + [A] (Mac OS X) to select all the modules, you can also select Edit > Select All from the top menu. 5. In the Camera View toolbar, select Show Control or press [Shift] + [F11]. This will display all the deformation controls in your scene. Refer to Displaying the Deformation Controls to learn other control display option. ‣ Click on the centre of the Deformation-Root pivot and drag it around to reposition the entire limb. ‣ Use the first bone or the pivot square handle to rotate the entire limb. ‣ Use the square control point located at the extremity of a bone to stretch or shorten its length. ‣ Use a bone next to an articulation to rotate it. You can also hold down the [Alt] key, this will lock all the controls and movement and only allow the rotation of the articulation. ‣ Click and drag the articulation’s diamond-shaped control point to modify its radius. 7. If needed, in the Deformation toolbar, disable the Show Simplified Manipulators option to display the advanced controls. ‣ Click and drag the round articulation control points to adjust the steepness (bias) of the articulation. ‣ Use the square articulation control point to rotate it. 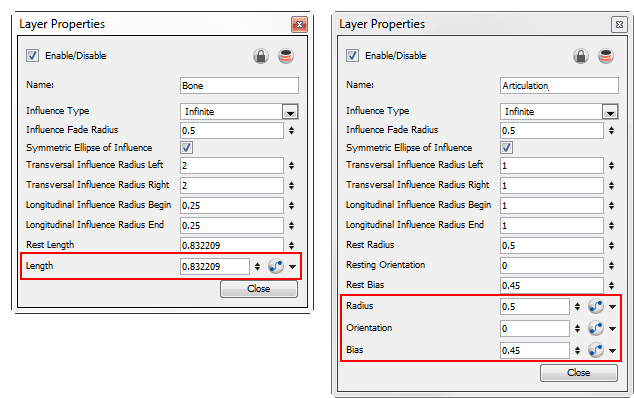 You can also manipulate the deformer by typing values directly in the Layer Properties of the deformation effect modules.